Millions of visitors a year? Of course there is shopping! Walking down the streets of the town of Lourdes your senses are accosted by the sights, sounds, and colors of the many shops that line both sides of the street. Some of the articles for sale are sacred, some profane, some just downright tacky. Of course, statues of the Virgin Mary are everywhere, along with portraits of Bernadette Soubirous, the young girl whose visions of the Virgin at the Massabielle Cave started the whole thing. There's a brisk trade in candles of all sizes, from small ones for 50 centimes to huge ones that cost in the hundreds of euros. 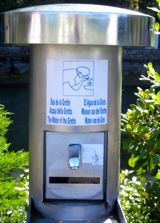 These are used both for the Torchlight Marian Procession and to place in the candle burners near the Massabielle Cave, where signs in multiple languages proclaim, "This candle prolongs my prayer." 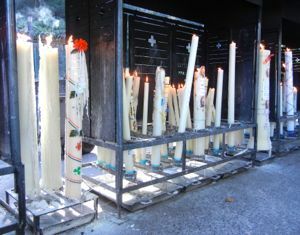 Candles have long played a role in religious ceremonies, and Lourdes is no exception. Religious medals, rosary beads, statues, and paintings of saints are displayed alongside more mundane items, such as tee shirts, aprons, raincoats, totebags, and postcards. At night it's even more shocking to walk through the shopping area, as the neon lights and gaudy signs make it easy to forget you are in a place of religious pilgrimage. "Provider of the Vatican" screams one sign in bright neon. "Palais du Rosaire," or Palace of the Rosary, is the name of another. Tourists—and pilgrims—have sought mementoes of their visits to important sites for centuries, and will continue to do so. 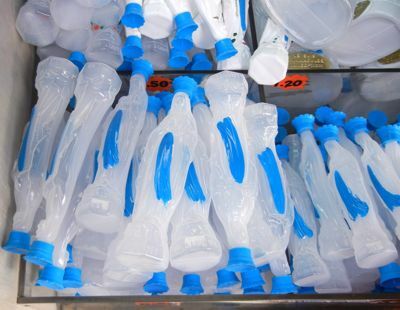 The shops of Lourdes offer the shopper a wide array of options. 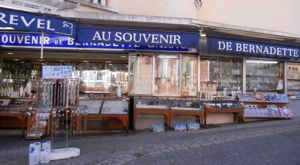 Above, Souvenir shop in Lourdes, France. Below, Some of the larger candles—two to three feet high—you can buy in Lourdes and light at the sanctuaries.